Virtual diva Hatsune Miku is set to hold her first concert in Malaysia this year, and the concert will feature the country’s top entertainer Zizan Razak, as well as Thailand’s YouTube sensation Chaleeda Gilbert as the opening acts! At the Miku Expo press conference yesterday, it has been revealed that the virtual singer will be singing a song by Malaysia’s top comedic actor. 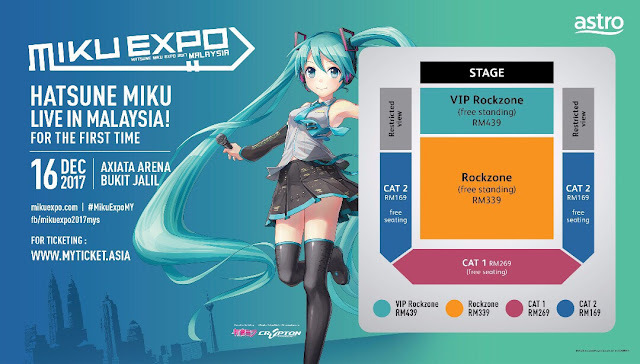 Zizan Razak, who is most known for his blockbuster movie “Polis Evo”, has revealed that Hatsune Miku will be singing his song “Chentaku” at the concert. “I’m so thankful to Astro and Crypton Media for having me for this concert. This is a great opportunity for Hatsune Miku’s international fans to get to know me,” said the 33-year-old entertainer. “I’m also happy to announce that Hatsune Miku will be singing my song “Chentaku” on that night – it’s going to be awesome,” Zizan added. So this means that it will be Miku’s first time singing in the Malay language! However, Miku has already showcased her talent of speaking in Malay yesterday in a short video greeting to her fans, check out the video we took below! Zizan has also confirmed that he will be singing two songs for the opening, one is the aforementioned “Chentaku” but the second song is yet to be decided. Thai-British singer Chaleeda Gilbert will also be taking the stage during the concert with two songs, her first single “Ready for Love” which she will be performing with Thai rapper Dandee, and also her latest song “Mind Over Matter” which was produced by Malaysia’s rapper SonaOne. “It is such an honour for me to be able to perform at such a huge event, I can’t wait to have fun with everyone and also Hatsune Miku,” said the 16-year-old singer. The concert which coincides with Hatsune Miku’s 10th year anniversary in Japan, is set to take place on 16 December 2017 on 8pm at the Axiata Arena. Ticket prices are set at RM169, RM269, RM339, and RM439, and will be going on sale through myticket.asia from 8 October onwards.